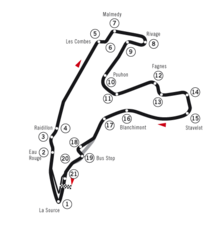 The 2004 Belgian Grand Prix (formally the Belgian Grand Prix) was a Formula One motor race held on 29 August 2004, at the Circuit de Spa-Francorchamps, near the town of Spa, Belgium. It was the 14th race of the 2004 Formula One Season. The race was contested over 44 laps and was won by Kimi Räikkönen, taking his and McLaren's only race win of the season from tenth place on the grid. Second place for Michael Schumacher won his seventh world championship, after beating third-placed Rubens Barrichello. Jarno Trulli started from pole position alongside Schumacher. The race saw many changes of the lead, but following several fortuitous safety cars, Räikkönen was leading the race for the final few laps. Mark Webber triggered a pile-up at the start, eliminating four cars and damaging several others, although he did admit to his mistake later. The race saw Christian Klien score his first championship points, and Olivier Panis and the Jaguar team their last. Ferrari had sealed the Constructors' Championship at the previous race, but the battle for second in the Championship, between Renault and BAR, was still fierce. Heading into the 14th race of the season, Michael Schumacher, driving for the Ferrari team, was leading the Drivers' Championship by 38 points from teammate Rubens Barrichello. Jenson Button, driving for BAR, was in third place, but only Schumacher and Barrichello could mathematically win the championship. However, the biggest story was the controversy surrounding Button's drive for 2005. Ten days before the Hungarian Grand Prix, Button chose to leave BAR and signed a two-year contract to return to Williams. This was surprising, as Button was enjoying his best season to date, while Williams had been struggling. BAR, however, insisted they had the right to exercise their option to keep Button. Button's management argued that the BAR option was not valid because it contained a clause allowing him to leave if BAR risked losing their Honda engines. They felt the new contract signed in the summer for Honda to supply engines to BAR was not definitive, and thus Button was free to move. There is a good view of that new incredible run-off where you could hold an entire kart meeting in there, including transporters and trucks! Four practice sessions were held before qualifying – two 60-minute sessions on Friday, 27 August, and two 45-minute sessions on Saturday, 28 August. All teams, with the exception of Ferrari, Williams, McLaren, and Renault, were permitted to run three drivers on Friday. Anthony Davidson, the third driver for BAR, set the quickest time in the first practice session, 1:45.104. Räikkönen set the fastest time in practice two. Saturday practice one was cancelled due to fog, and Barrichello set the quickest time in Saturday practice two, shortened from 45 to 30 minutes as a result of the fog that had cancelled practice one. Saturday's second practice session saw two major excursions from Antônio Pizzonia and Gianmaria Bruni, the latter causing the session to be red-flagged. Jarno Trulli took pole position for the Renault team. Qualifying was split into two sections. In the first season, dubbed "pre-qualifying", each driver took turns to record one lap at a time. The order the cars ran in was the reverse order to the classified results at the 2004 Hungarian Grand Prix. For example, Michael Schumacher won the race, so would be the last car to run in pre-qualifying. The second qualifying session (dubbed "qualifying") repeated this process (with the drivers running in reverse order to the pre-qualifying results), but with the caveat that the drivers would not be allowed to alter their fuel loads between then and the race. The fastest time in the second session would take pole. As in 2003, setups and fuel loads could not be altered between the end of the second qualifying session and the race. In pre-qualifying, Ricardo Zonta, driving for Toyota, spun off at Pouhon corner, leading him to collide with the tyre wall. The second part of qualifying started as being very wet but quickly dried out, enabling Jarno Trulli to switch to intermediate tyres, enabling him to set the fastest lap time. Schumacher qualified second. The conditions did not suit Jenson Button, who had run on wet tyres when the track was ready for intermediates, and Juan Pablo Montoya, who did his qualifying lap on intermediates as it began to rain. Trulli's Renault had a good start from pole position, but second-placed Schumacher's Ferrari did not, and he lost positions to Fernando Alonso's Renault and David Coulthard's McLaren. At La Source, Mark Webber's Jaguar collided with Barrichello's Ferrari, causing Webber to lose his front wing and Barrichello to suffer rear wing damage. In a separate incident, Räikkönen's McLaren made contact with Felipe Massa's Sauber, which caused Massa to lose his front wing. In a third incident, Nick Heidfeld's Jordan and Olivier Panis's Toyota made contact. Going into Eau Rouge, Webber was side-by-side with Takuma Sato's BAR, and they collided in the middle of the corner whilst they were overtaken by Montoya's Williams. The contact broke Sato's left rear suspension and Webber's front right suspension. Sato consequently spun in the middle of the track. The rest of the field attempted to avoid the spinning BAR, but in doing so, Zsolt Baumgartner and Gianmaria Bruni, both driving for Minardi, made contact, putting Bruni out of the race and getting him hit by Giorgio Pantano's Jordan. Sato, Webber, Bruni, and Pantano were out of the race. A small fire on Bruni's car, caused by the contact with Pantano, forced the safety car to come out. During this time, Button, Massa, Barrichello, Heidfeld, Baumgartner, and Olivier Panis stopped for repairs caused by debris. Massa and Barrichello stopped twice. The safety car came in at the end of lap four and Trulli led Alonso and Coulthard. Räikkönen overtook Schumacher for fifth position and Button overtook Ricardo Zonta's Toyota. Schumacher continued to be slow, losing 1.1 seconds to Räikkönen in the middle sector on lap five, enabling Montoya to overtake him around the outside of the Bus Stop chicane on lap five. On lap six, Räikkönen overtook his teammate, Coulthard, for third, going up the inside at the Les Combes chicane. On lap eight, Barrichello overtook Baumgartner and Heidfeld, putting him into 14th place. Christian Klien, in the sole remaining Jaguar, was the first driver to make a scheduled pit stop, on lap nine, and race leader Trulli made a pit stop on lap 10, rejoining in ninth place. Alonso now led the race, but on lap 12 he had an oil leak and spun twice at Les Combes, losing the lead to Räikkönen. He managed to rejoin, but he then had a further spin at Rivage for the same reason and could not rejoin. On the same lap Coulthard had a rear tyre de-lamination, but he made it back to pit lane. Räikkönen stopped at the end of lap 13. Montoya now led the race from Schumacher, until Montoya pitted on lap 15. Montoya left the pit lane behind Massa, losing time while overtaking him. Schumacher pitted one lap later and leapfrogged Montoya. New leader Pizzonia came into the pits on lap 17. Räikkönen now led from Button in second, Trulli in third, and Schumacher in fourth, but Schumacher was able to overcome Trulli on lap 19. Giancarlo Fisichella's Sauber ran wide on lap 20 and lost parts of his front wing. On the same lap, Montoya attempted to repeat his earlier overtake on Trulli, but the pair collided, putting Trulli into a spin. Trulli lost several places, and Montoya lost fourth place to his teammate, Pizzonia. Button pitted on lap 21, rejoining in seventh, behind the battling Fischella and Barrichello. Barrichello then took fifth place on lap 22, as Trulli made a second pit stop, having been passed by Panis. Button was also able to pass Fisichella for sixth position on lap 23, as Barrichello pitted. Räikkönen pitted on lap 29, rejoining in second position, while Schumacher still had to stop. Montoya pitted on the same lap as Räikkönen. On lap 31, Button suffered a right rear tyre de-lamination similar to Coulthard's, at approximately 205 mph (330 km/h), pitching him into a spin. As a result, he crashed into the Minardi of Baumgartner, who was being lapped, putting both drivers out of the race and bringing out a safety car. Schumacher, Pizzonia, and Heidfeld took the opportunity to pit behind the safety car. Still behind the safety car, on lap 32, Pizzonia retired due to a gearbox problem. Räikkönen led the race from Schumacher, Montoya, Barrichello, and Zonta, who started last. At the restart on lap 34, Klien overtook Panis for eighth place and one point, as Coulthard overtook Trulli for tenth place. One lap later, Coulthard overtook Panis for ninth. On lap 36, Montoya's rear right tyre de-laminated, forcing him to retire. On lap 38, Coulthard attempted to overtake Klien for seventh place, but contact between the two drivers meant Coulthard needed a new front wing after it broke loose and became stuck over his own rear wing. [clarification needed] The resulting debris caused the safety car to come out again. The safety car came in at the end of lap 41, but just four corners later, fourth-placed Zonta's engine blew up spectacularly, putting him out of the race. On the penultimate lap, Coulthard overtook Panis for seventh. Räikkönen won the race, his first and only victory of 2004. Schumacher finished second, with teammate Barrichello third. The result gave Schumacher his seventh World Drivers' Championship. At the 2005 British Grand Prix, Daily Express editor Bob McKenzie honoured a pledge that he would run naked around Silverstone if McLaren won a race in 2004. ^ "Michael's magnificent seven". Retrieved 10 January 2016. ^ Garside, Kevin (6 August 2004). "Button renews old links with Williams". The Daily Telegraph. Retrieved 31 December 2010. ^ a b Benson, Andrew (6 August 2004). "Will team switch undo Button?". BBC Sport. Retrieved 31 December 2010. ^ "BAR win Button contract dispute". BBC Sport. 20 October 2004. Retrieved 31 December 2010. ^ a b c "Grand Prix Qualifying Live". 2004. 28 August 2004. ITV. ITV1. ^ "Martin Brundles Racing Lines – 2004 Races". Retrieved 15 December 2014. ^ "2004 Belgian Grand Prix – Friday Practice 1". Formula1.com. Formula1.com Limited. Archived from the original on 16 December 2014. Retrieved 27 December 2015. ^ "2004 Belgian Grand Prix – Friday Practice 2". Formula1.com. Formula1.com Limited. Archived from the original on 16 December 2014. Retrieved 27 December 2015. ^ "2004 Belgian Grand Prix – Saturday Practice 1". Formula1.com. Formula1.com Limited. Archived from the original on 16 December 2014. Retrieved 27 December 2015. ^ "2004 Belgian Grand Prix – Saturday Practice 2". Formula1.com. Formula1.com Limited. Archived from the original on 16 December 2014. Retrieved 27 December 2015. ^ "Grand Prix Live". 2004. 29 August 2004. ITV. ITV1. Trulli sets pole on intermediates. ^ "Grand Prix Live". 2004. 29 August 2004. ITV. ITV1. ^ Benson, Andrew (10 July 2005). "British GP diary". BBC. Retrieved 11 April 2013. ^ "2004 Belgian Grand Prix – Saturday Qualifying Results". Formula1.com. Formula1.com Limited. Archived from the original on 16 December 2014. Retrieved 27 December 2015. ^ "2004 Belgian Grand Prix – Race Results". Formula1.com. Formula1.com Limited. Archived from the original on 16 November 2014. Retrieved 27 December 2015. ^ a b "Belgium 2004 - Championship • STATS F1". www.statsf1.com. Retrieved 13 March 2019. Wikimedia Commons has media related to 2004 Belgian Grand Prix. This page was last edited on 13 March 2019, at 14:48 (UTC).